Rottweilers are an energetic, muscular dog breed and require balanced nutritional food to meet their energy and enthusiasm. Royal Canin Rottweiler adult food has been specially formulated to meet the health and energy requirements of the dog. The kibble formula is packed with nutritients and micro nutrient that promte good health and support the hip and joint health of the dog too. 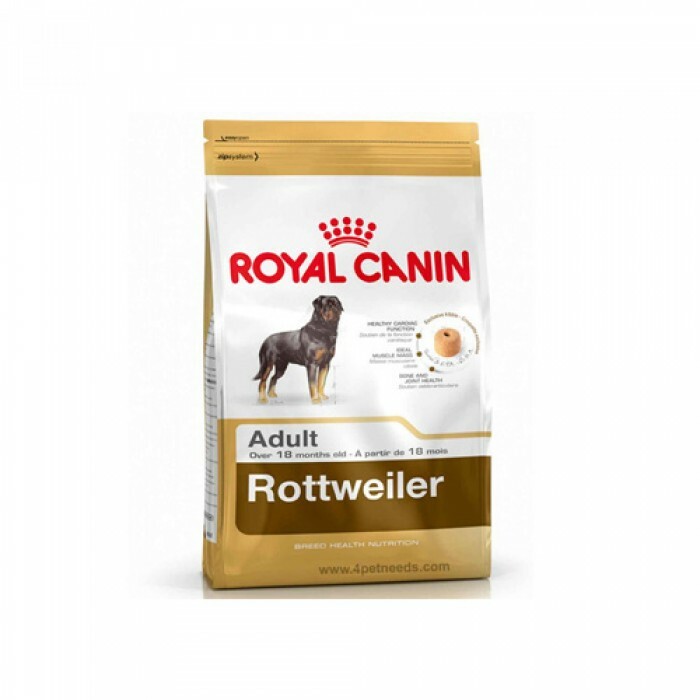 Since they are a large breed dog, Rottweilers require food that helps them stay strong and make their bones strong to bear the weight of their entire body. The presence of antioxidant complex helps to neutralize free radicals in the blood stream. The adapted Taurine content in the food helps to maintain a healthy heart in your pet. Along with this it is fortified with high quality proteins and dietary fibers, which ensure an effective digestive system in your pet. It is a complete food and does not require additional additives.